Out of over 1 million people with disabilities in Hungary, more than 20,000 families raise young disabled children. The lack of public awareness, ineffective policies and a segregated education cause life-long isolation for this group. These children miss out on integration opportunities in their early years and remain hidden throughout their lives. This life-long isolation makes it impossible for them to become contributing members of society and to pursue opportunities society has to offer to live a fulfilling life. After starting their early years of social interaction in a segregated institution, usually far from their home, with limited resources, there is slight chance to break out. There is no clear understanding of what a policy of inclusion entails and what role it can play in building a cohesive social environment that creates empathetic citizens willing to collaborate and take responsibility for their community. Because inclusion is not fully understood by the public and segregation persists on various levels, there is little public demand for its furtherment, and the government has little initiative to introduce legislative changes, develop financial measures and provide methodological support – despite the recommendations of international bodies. Having few opportunities to interact with others since childhood, it is easy for disabled children to acquire a stigma, inhibiting their personal and professional development. Programs and solutions to reach inclusivity are mostly follow-up, targeting adulthood. There is an emerging wave of communities, policy-makers and educational institutions willing to break the vicious cycle of exclusion of disabled children (and adults) and promote inclusion on a local level. With Eszter gaining more and more visibility, these players are getting to know her work and becoming her allies. She also identified ‘green-light’ people in the teacher training institutions who want to work on more modern and inclusive teacher training materials and educational tools that will enable Hungary’s new generation of teachers to create a more inclusive environment in their schools. As the awareness about MagikMe has grown in Hungary, more and more kindergarten teachers have reached out to Eszter, inquiring about the possibility of bringing her work to their community. She brings her program to communities where these ‘green light’ people (who are open to her initiative) are present, as they will become her local ambassadors, enabling the formation of communities and opening up the doors of local kindergartens to those disabled children who would otherwise have to attend segregated kindergartens. The support from local communities, open-minded teachers in kindergartens and tolerant non-disabled peers opens up the system and ultimately creates more inclusive institutions, allowing disabled children to become active members of our society. Aspiring to alleviate social exclusion experienced by families with young disabled children, Eszter co-founded MagikMe, a social venture engaged in the production of inclusive playground equipment, the development and support of local communities, as well as in working with kindergarten teacher training institutions to spread the necessary tools and know-how for inclusive kindergartens. As playgrounds are essential community spaces in Hungary, Eszter works to transform these popular sceneries to become a vehicle of change towards an inclusive and emphatic society. Eszter envisions integrated communities, where families with disabled children can have an empowering local support network, which has the potential to raise real inclusivity on an institutional level through effective self-advocacy and leading by example. The experience of playing together at playgrounds in early childhood produces a long lasting effect on the socio-emotional development of abled and disabled children alike. Playing together in early childhood also prepares these children to continue to play and work together as they become classmates in kindergartens, thus breaking down biases in the early formative years. Eszter’s second son, Áron, was six months old when the family learned he was suffering from epilepsy. It was a turning point in her life. She not only had to see him suffer from countless seizures, but also had to face open discrimination. Even though she came from an educated family, she was not equipped to prevent the heartbreaking experience of seeing other children simply leaving Áron out of the fun at the playground, and consequently missing out the first stage of socialization in his life. Eszter was born into an intellectual middle-class family in Hungary. Her first community experience occurred in her late teens, when she learned about her Jewish roots and stories about her family. That was enough motivation for her to start exploring her Jewish roots. 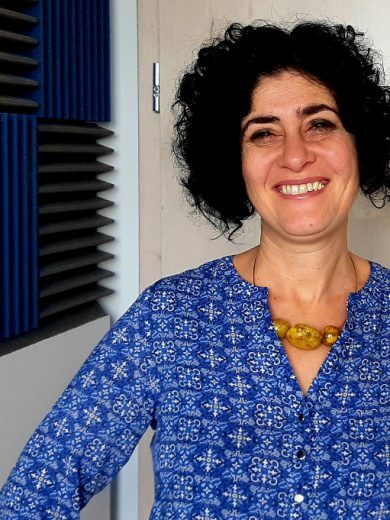 She established a strong network of like-minded peers and became a founding member of a community that was cultivating Jewish culture while serving as a safe space for the community members. It has proved to become a lifelong support structure for Eszter, with many of these friendships remaining in her life even today. The positive experiences she gained from belonging to a community was a fundamental force that helped shape her values and priorities. During her university years, she completed her sociology studies while volunteering with several projects: she supported the integration of Roma communities in the VI district of Budapest and co-hosted a radio program broadcasting interviews with marginalized communities. Volunteering became a constant value in her life, which she continued to pursue even after embarking on a demanding professional career. She has experienced how her non-disabled son had learned to play together with his disabled sibling while also seeing Áron’s kindergarten peers learn and enjoy playing together with him. These profound observations led her to start her work towards integrated communities. Over the past years, she managed to spread her message nation-wide and beyond Hungary’s borders. Inquiries found her from all over the world, including India and South Korea, among others. She has also received numerous international awards for her work, including the Zero Project award for the best innovative solutions in accessibility in 2018, finalist in the European Investment Bank’s Social Tournament in 2017 and winner of Women’s Entrepreneur of the Year Award by the Visegrad Four in 2018.